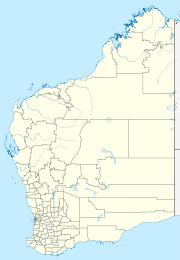 Billiluna (also referred to as Mindibungu) is a medium-sized Aboriginal community, located approximately 150 km south of Halls Creek in the Kimberley Region of Western Australia, within the Shire of Halls Creek. In the 2011 census, Billiluna had a total population of 258, consisting of 244 Aboriginal and Torres Strait Islander people. Billiluna was established as a permanent Aboriginal community in the late 1970s by Indigenous people moving away from the Balgo mission to the Billiluna Pastoral Station. A major factor behind this was the transfer of the pastoral lease from a private company to the Aboriginal Lands Trust in 1978. The community became an incorporated entity in 1979 and the first houses and school were constructed in the same year. The community is located within the determination area of the Tjurabalan People (WAD160/1997) Native Title claim. Children of school age at Billiluna attend the Kururrungku Catholic Education Centre. The school caters for approximately 80 enrolled students between pre-primary to year 10 with 7 registered teachers and a principal. The community is managed through its incorporated body, Mindibungu Aboriginal Corporation, incorporated under the Aboriginal Councils and Associations Act 1976 on 12 December 1979. Billiluna Layout Plan No.1 has been prepared in accordance with State Planning Policy 3.2 Aboriginal Settlements. Layout Plan No.1 was endorsed by the community on 22 September 2011, and by the Western Australian Planning Commission (WAPC) on 24 July 2012. The Layout Plan map-set and background report can be viewed at Planning Western Australia's official site. This page was last edited on 29 August 2018, at 16:31 (UTC).